October 3, 2014: updated to reflect Microsoft's rebranding and subsequently changing the name of Hosted TFS to Visual Studio Online. Additionally this posted was updated to reflect the prices of Visual Studio as of October 3, 2014. This article introduces Microsoft's cloud-based Team Foundation Server (TFS), Visual Studio Online. Signing up for Visual Studio ONline will be demonstrated as will how to access this cloud-based TFS from Visual Studio 2012. Visual Studio Online is free for up to five users -- at least for the present (as of September 2013). This cloud-based version of TFS supports source code control, bug/work-item tracking and project management. More importantly, this service places your source code in an environment where Microsoft will provide, free of charge, complete source control backup. Developers can access source code remotely using a standard Microsoft accounts. The URL used to access an instance of Visual Studio Online is of the elegant form (a vanity URL): YOUR_NAME_HERE.visualstudio.com. A classic use of Visual Studio Online came when I started working at a firm that was using SVN. The server hosting SVN was an older PC, running Linux, setup by a developer who was no longer at the firm. The company used outsourced IT and the SVN host was rarely backed up if ever. There were five developers on the team. In order to access SVN remotely developers had to access the company's incredibly slow VPN. Visual Studio Online was an easy sell in this environment. Signing up for Visual Studio Online is straightforward. If you already have a Microsoft account (hotmail.com, live.com, outlook.com, etc.) skip to Step 2. You can also skip to Step 2 if your work email address is already mapped to be used as a Microsoft account. It is important to note that your Microsoft account will be the initial administrator for Visual Studio Online. Other administrative rights can be assigned once signup is completed. Step 1: create a Microsoft account. You can use your work email as Microsoft account name and sign up at https://signup.live.com/signup.aspx or just create an email account at Outlook.com. Step 2: in Internet Explorer (when working with Microsoft service, IE is often the best choice of browsers) navigate to http://tfs.visualstudio.com. Step 3: clearly shown on this page is the "Sign up for free" button which should be clicked on. Step 5: click on "Create Account" which will display the log in screen for the Microsoft account. Step 6: sign in using your Microsoft account. You may have to provide additional information as Microsoft validates your account. Step 8: clicking on "Create project" will create the project within TFS. 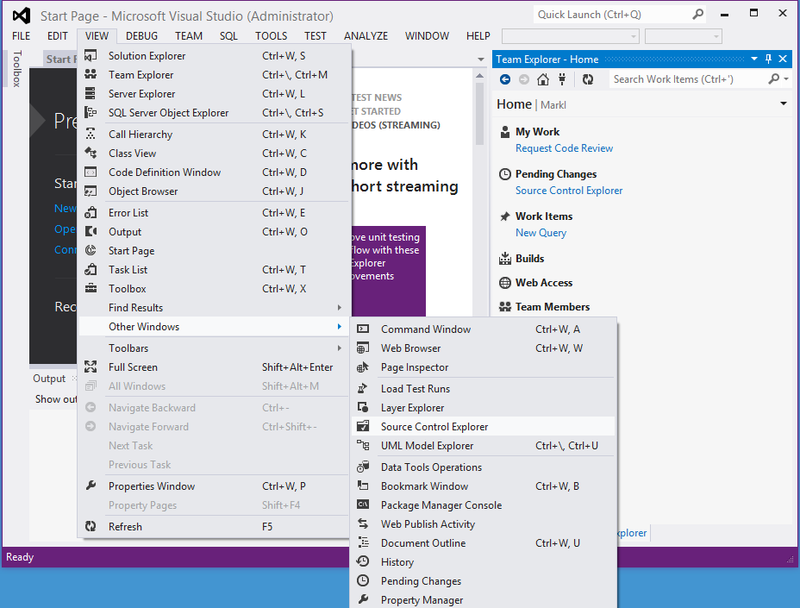 Remember that Visual Studio Online provides process management capabilities so for "Process template" the template, "Microsoft Visual Studio Scrum 3.0" was selected (the default value). Step 10: click on "Manage all members..." in order to add your coworkers as TFS users. Make sure your coworkers have created Microsoft accounts so they can be added to TFS as users. From this screen the MarkI project can be checked following by clicking on the "Connect" button which closes the "Connect to Team Foundation Server" dialog. The connection to TFS is established along with a connection to the MarkI project. Of note for any startup for small development firm is user plan "Visual Studio Online Basic". As stated previously (and above in the screenshot) five users with access to source code control (a.k.a. "5 users FREE"). Not mentioned in any of the user plans are the unlimited stakeholders.